6 x 1 Kilo Bags of Premium Italian Coffee. Packed In High Quality Foil. Gimoka Gran Bar combines the finest Arabica coffee from South America, blended with African and Indian robustas. Full-bodied blend with remarkable flavour. Gran Bar blend is created by Gimoka coffee Artisans employing the most advanced technology and long standing experience in blending the individual varieties selected from all around the world. Coffee is roasted in Italyaccording to the traditional artisan practice, gently grounding and packaging the beans to preserve the aroma as long as possible. 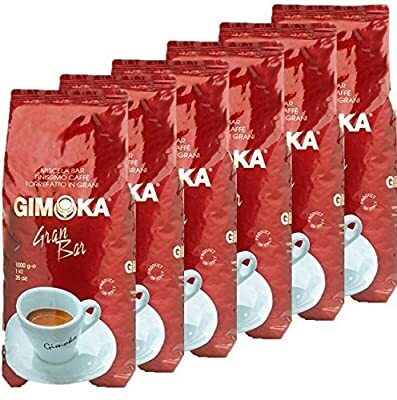 6 Kilos Italian Coffee Beans Gimoka Gran Bar Gran Bar coffee is a full-bodied coffee with an intense aroma, dense crema, aftertaste notes of chocolate. Blend 80% robusta and 20% arabica beans Roasted in Italy, 100% Italian coffee Gimoka Coffee UK: passion and tradition for Italian coffee.